A middle-ear effusion is a common cause of conductive hearing loss. 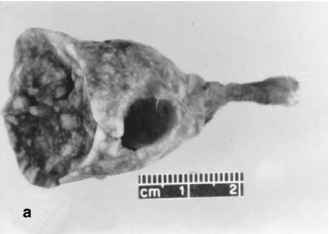 It may occur when either a head cold or barotrauma interferes with eustachian tube function, and it often follows acute otitis media. 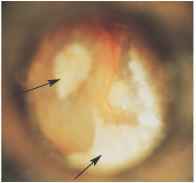 A postnasal space neoplasm may also cause eustachian tube dysfunction, and is to be excluded in any adult with a persistent otitis media with effusion. 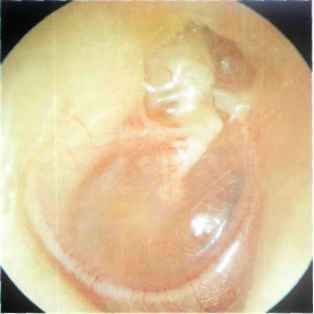 In children, otitis media with effusion is very common when adenoid tissue interferes with the eustachian tube. 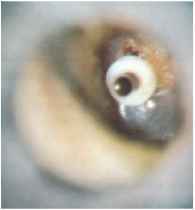 The middle-ear fluid tends to be tenacious (glue ear), unlike the thin, straw-colored exudate of adults. 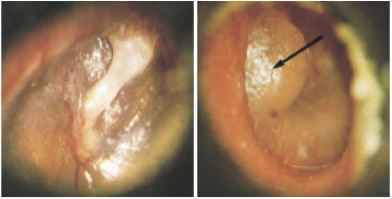 Middle-ear fluid, if persistent, may cause permanent changes in the drum. An otitis media with effusion can cause hearing loss for decades, and the diagnosis is frequently overlooked in a long-standing hearing loss. 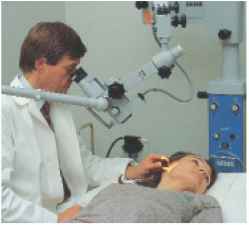 Impedance audiometry helps in diagnosis. 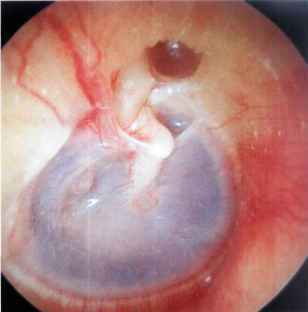 There is no successful treatment at present for chronic otitis media with effusion when this fails to respond to insertion of a grommet. 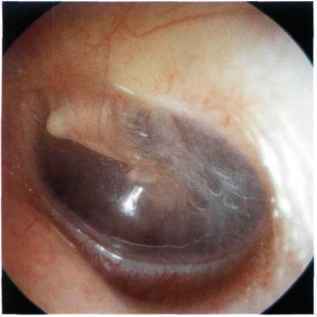 A further problem with chronic otitis media with effusion is the return of middle-ear fluid with hearing loss when the grommet extrudes. A larger flanged grommet (long-term grommet) which remains in position longer, and periodic replacement are the present remedies. To understand fully when it is appropriate to treat otitis media in children, the pathophysiology of the various subtypes of otitis media should be understood and the appropriate diagnosis must be made. In addition, various treatment modalities for otitis media both medical and surgical may benefit a particular patient. The importance of individualization of treatment for every patient with otitis media must be emphasized. Otitis media is a multifactorial process. Different treatment modalities may be warranted in patients based on their particular social situation, immunologic status, age, associated medical problems, or other factors. Various treatment modalities for otitis media will be briefly discussed to help the practitioner decide which patient should be treated, and by what particular treatment strategy. If examination of the drum and meatus is normal in a patient complaining of earache, the pain is referred. Referred ear pain may be from nearby structures such as the temporo-mandibular joint, neck muscles, or cervical spine. It may also be from the teeth, tongue, tonsils, or larynx. Cranial nerves V, IX, and X which supply these sites have their respective tympanic and auricular branches supplying the ear. Earache also frequently precedes a Bell's palsy. To see the drum more clearly, therefore, the pinna is retracted backwards and outwards. The index finger may be used to hold the tragus forward. If this step of straightening the meatus accentuates the pain in someone presenting with an earache, one can be virtually certain that the diagnosis is either a furuncle or furunculosis (see Fig. 2.43). During pregnancy, C. trachomatis may be transmitted from mother to fetus, which may cause premature rupture of the membranes, premature labor, and increased fetal morbidity and mortality. Pregnant women who deliver vaginally or by cesarean section can transmit the bacteria to their infants. These newborns can develop otitis media, conjunctivitis, blindness, meningitis, gastroenteritis, respiratory infections, and pneumonia. Because mothers are often asymptomatic, medical personnel are unaware that the maternal-infant transmission has occurred until infants become very ill. This causes severe ear pain and a combination of lesions in nerves VI, VII, VIII, and V, and is known as Gradenigo's syndrome Tsementzis, Differential Diagnosis in Neurology and Neurosurgery 2000 Thieme All rights reserved. Usage subject to terms and conditions of license. Adults One 875-mg tablet q 12 hr or one 500-mg tablet q 8 hr. Children over 3 months old 45 mg kg day of amoxicillin in divided doses q 12 hr or 40 mg kg day in divided doses q 8 hr (these doses are used in children for otitis media, lower respiratory tract infections, or sinusitis). Treatment duration for otitis media is 10 days. Uses Acute bacterial exacerbations of chronic bronchitis due to Haemophilus influenzae (including beta-lacta-mase-producing strains), Moraxella eatarrhalis (including beta-lacta-mase-producing strains), and penicillin-susceptible strains of Strepto-eoeeus pneumoniae. Acute bacterial otitis media due to H. influenzae, M. eatarrhalis, and Staphylococcuspyo-genes. Pharyngitis and tonsillitis due to S. pyogenes. Children pharyngitis, tonsillitis, acute bacterial otitis media. 9 mg kg, up to a maximum of 400 mg daily, for a total of 10 days. Give children over 45 kg the maximum daily dose of 400 mg. Measures useful in diminishing tympanostomy tube otor-rhea are widely discussed and debated among otolaryngologists. The safety and effectiveness of these measures are controversial. Factors considered, at least by some physicians, to decrease the incidence of postoperative tympanostomy tube otorrhea include control of environmental and behavioral risk factors for otitis media, antiseptic preparation of the ear during tympanostomy tube insertion, tube material, topical antibiotics at tube insertion, and perhaps for a few days later, and water precautions (i.e., keeping water out of the ear). Dose may be doubled in more severe infections or those caused by less susceptible organisms. Total daily dose should not exceed 4 g. Children 20 mg kg day in divided doses q 8 hr. Dose may be doubled in more serious infections, otitis media, or for infections caused by less susceptible organisms. For otitis media and pharyngitis, the total daily dose may be divided and given q 12 hr. Total daily dose should not exceed 1 g.
The organism is a Gram-negative bipolar staining rod. It is a pathogen of low virulence, and most infections are clinically inapparent. There are few reports of Pasteurella pneumotropica as a primary pathogen, causing pneumonia, otitis media, and conjunctivitis. It is a co-pathogen with Mycoplasma and Sendai virus, resulting in pneumonia and otitis media. Meningitis is an infrequent but potentially life-threatening complication of PLFs.41, 90-93 The abnormal opening between the sterile inner ear and an infected middle ear potentially allows bacteria and viruses to enter the inner ear space. Since peri-lymph is continuous with the CSF, invading organisms can infect the CSF, meninges, and brain, causing meningitis and cerebritis. Because meningitis and cerebritis are life-threatening,94 PLFs from any cause should be closed, through either conservative or surgical means, without delay. Patients with active PLFs should also be instructed to seek medical treatment immediately if they develop symptoms or signs of an upper respiratory or middle ear infection. Auditory disorders are classified as conductive, sensorineural or mixed conductive-sensorineural hearing loss. 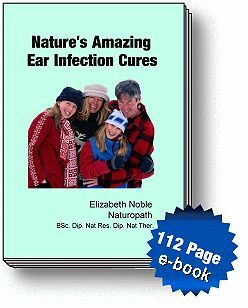 Causes include damage to the inner ear structures or the auditory nerve from congenital defects, infection, ototoxic drugs, long-term excessive exposure to noises (sensorineural) or middle ear infection such as otitis media (conductive). Related to an accurate diagnosis, there is a difference in the prevalence of bacterial pathogens that are isolated from ears of patients with acute otitis media compared to aspirates of otitis media with effusion. This, in turn, has an impact on the decision to recommend or not recommend antimicrobial therapy. Pathogenic bacteria are present in approximately 70 of the middle ears of patients who have acute otitis media, and are similar in type in both children and adults.2'3 Streptococcus pneumoniae (40 ), Haemophilus influenzae (25 ), and Moraxella catarrhalis (12 ) are the most common pathogens isolated. Group A b-hemolytic streptococcus and Staphylococcus aureus also cause this infection in both children and adults, but not as frequently as pneumococcus and H. influenzae. Respiratory viruses have been cultured from as many as 20 of acute effusions. Many question the need to treat otitis media with effusion, because the effusion will resolve in most children without active treatment in 2 or 3 months. Nevertheless, treatment may be indicated in some children, because there are possible complications and sequelae associated with this condition. Since hearing loss of some degree usually accompanies a middle ear effusion, treatment may be warranted when longstanding impairment in hearing is present. Although the significance of this hearing loss is still uncertain, such a loss may impair cognitive and language function and result in disturbances in psychosocial adjustment. Important factors that should be considered when deciding to treat or not to treat are listed in Table 78-5. Once the Salmonella bacterium is ingested, it multiplies rapidly in the mucosal layers of the stomach and small intestine. The greater the number of organisms ingested, the shorter the incubation period typically, incubation is 8 to 48 hours after ingestion of contaminated food or liquid, and symptoms usually last for 3 to 5 days. An inflammatory response in the tissues produces gastroenteritis. The infection may stop there, or the salmonella organisms may travel via the lymph and vascular system throughout the body. The dissemination of organisms produces lesions in other organs or, possibly, sepsis. Systemic lesions may result in appendicitis, peritonitis, otitis media, pneumonia, osteomyelitis, or endocarditis. Symptoms of intermittent fever, chills, anorexia, and weight loss indicate sepsis. Both clinical and animal research have shown evidence of auditory brainstem abnormalities in the setting of unilateral conductive hearing loss. For example, Moore et al.6 have experimentally induced unilateral conductive hearing losses in ferrets during critical periods. Various abnormalities in the development of binaural neural elements in the auditory brainstem pathways were noted. Clinical studies of adults with unilateral conductive hearing loss using auditory brain stem responses (ABR) and the masking-level difference (MLD) have also documented abnormalities in brain stem auditory processing.7 Specifically, delays in wave V and in I to V and III to V interwave intervals were noted. The MLD, a behavioral test that measures the sensitivity of the auditory system to interaural differences of time and amplitude, was reduced, and they correlated significantly with the ABR abnormalities. These changes were similar to those observed in children with chronic otitis media with effusion. Otitis media in patients who have severe otalgia, are seriously ill, or appear toxic 3. 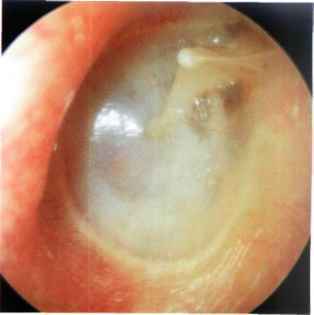 Onset of otitis media in a patient who is receiving antimicrobial therapy 4. Otitis media associated with a confirmed or potential suppu-rative complication 5. Otitis media in a newborn, sick neonate, or immunologically deficient patient, any of whom might harbor an unusual organism Patients who still have a middle ear effusion present at the 4- to 6-week visit should be reevaluated 3 to 4 months after the onset of the infection those without effusion at 4 to 6 weeks can be discharged. Management of persistent middle ear effusion is similar to that described below for patients who have otitis media with effusion. Assess history of chronic otitis media, brain infection, use of ototoxic drugs, rubella or other intrauterine infections (viral), congenital defects of ear or nose, presence of deafness in family members, hypoxemia and increased bilirubin levels in low-birth weight infants. Otitis media, the most common cause of antibiotic prescription in the United States, is an infection of the middle ear that can occur in several forms. Acute otitis media (AOM) is a suppurative (pus-forming) effusion of the middle ear with acute onset, presence of middle ear effusion (MEE), and signs of middle ear inflammation. 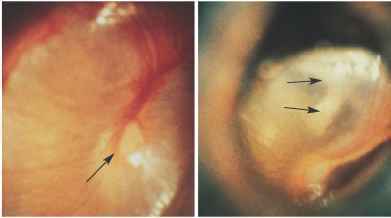 Bullous myringitis is AOM that leads to bullae formation between the middle and the inner layers of the tympanic membrane. Persistent otitis media occurs when an acute infection does not resolve after 4 weeks of treatment. Recurrent otitis media occurs in children with three separate bouts of AOM within a 6-month period, six within a 12-month period, or six episodes by 6 years of age. Ostitis media is common, and at least half of children have their first epidose prior to their first birthday. Action Kinetics Cefuroxime axetil is used PO, whereas cefuroxime sodium is used either IM or IV. Uses PO (axetil). Pharyngitis, tonsillitis, otitis media, sinusitis, acute bacterial exacerbations of chronic bronchitis and secondary bacterial infections of acute bronchitis, uncomplicated UTIs, uncomplicated skin and skin structure infections, uncomplicated gonorrhea (urethral and endocervical) caused by non-penicillinase-producing strains of Neisseria gonorrhoeae. Early Lyme disease due to Borrelia burgdorferi. The suspension is indicated for children from 3 months to 12 years to treat pharyngitis, tonsillitis, acute bacterial otitis media, and impetigo. Contraindications Hypersensitivity to cephalosporins. Use in infants < 1 month. 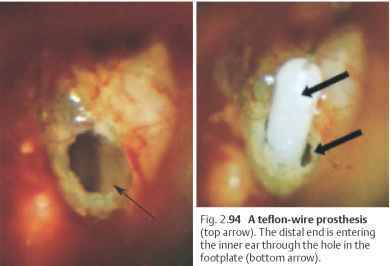 Acute otitis media. Children 250 mg b.i.d. for 10 days. Acute otitis media, impetigo. Children, 3 months to 12 years 30 mg kg day in 2 divided doses, not to exceed 1,000 mg total dose day, for 10 days. Assess for presence of associated symptoms diarrhea, fever, ear pain, UGI symptoms, vision changes, headache, seizures, high pitched cry, polydipsia, polyuria, polyphagia, anorexia, and so forth record intake and output, including all body fluid losses, IVs and oral fluids (specify frequency). Although audiometric criteria can be defined quantitatively, the true art of patient selection is centered on computed tomographic (CT) evaluation of the middle ear and mastoid. Hypoplasia of the middle ear space, ranging from mild to severe, occurs in most cases of aural atresia, and ossicular development can be expected to correlate directly with middle ear size. 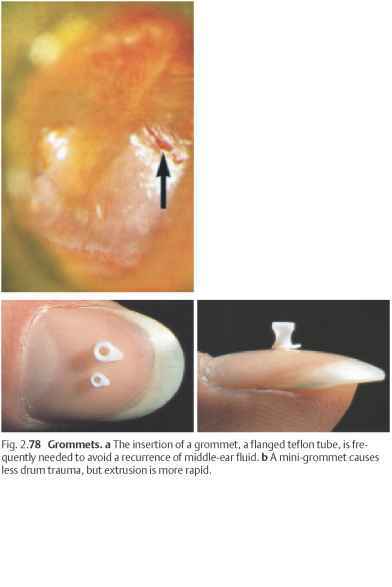 The risk of surgical complications will be minimized and the chances for a successful hearing result increased if the middle ear and mastoid are aerated and at least two-thirds of the normal size, and if all three ossicles (although deformed) can be identified. 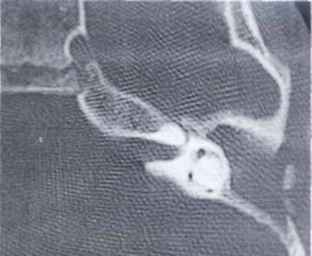 Rarely, a well-developed middle ear mastoid containing fluid will be encountered. 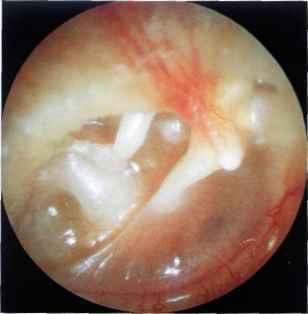 To rule out a resolving otitis media or temporary eustachian tube dysfunction, a repeat scan 6 to 12 months later is recommended. Persistent middle ear fluid is a contraindication to surgery, although reassessment when the child is a teenager is reasonable. 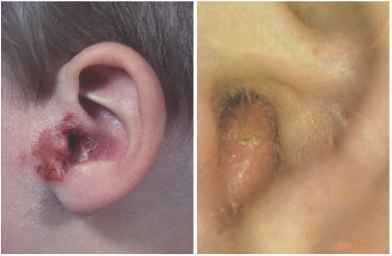 Ramsay-Hunt syndrome The classic description includes the following triad of findings (1) zoster lesions on the pinna (see Photo 16), meatus, and canal or tympanic membrane of one ear, (2) severe ear pain, and (3) an ipsilateral facial nerve palsy (see Photo 17). Vestibular symptoms and sensorineural hearing loss may also occur. 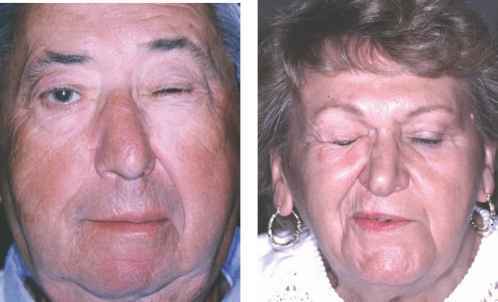 The facial paralysis is usually complete and the recovery rate is low. Taste and lacrimation may also be affected.